Is retail New Zealand just tinkering with Social Media? Today I called into a shopping mall to grab a coffee. 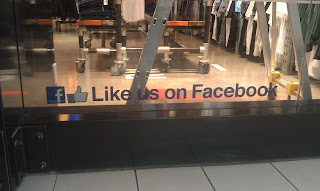 Some time ago I had called into the same mall and had noticed that most shops showed some form of signage relating to either Facebook or Twitter. Usually I take a mental note of who they are while keeping an eye out on their progress. Today I was somewhat surprised to find all but about 3 shops had removed such signage. For a retailer, the shop window is key real estate. Items must be displayed in such a way as to drive customers into the shop. A smart retailer will know what displays get the best results. To have other signage which is not having a measurable effect could well become a distraction. I'm going to have discussions with a number of these retailers to find out more. My initial assumption is that quite a few companies are tinkering with Social Media and are not able to see a return on their investment. Social Business is about being able to connect with both employees and customers. By building well nurtured relationships with prospects and customers, business will happen. If you have a Facebook or Twitter logo on your website or shop window, think about how to use this to better connect with your customers. How can you build more meaningful relationships? I recommend that you move your mindset away from using Social Media for marketing and view it as a customer engagement tool.